Fig. 1. Hymnal Noted, Parts I & II (London: Novello, 1856). The stated Lisbon source caused no small amount of consternation among hymnologists who were unable to confirm the attribution. For example, the editors of The Music of the Church Hymnary (London, 1901) wrote, “These Missals have all been examined by the Rev. W. Hilton of the English College, Lisbon, but this melody is not to be found in them” (p. 156). Thomas Helmore, the music editor for the Hymnal Noted, indicated in an article on plainsong in Stainer & Barrett’s Dictionary of Musical Terms (1881), that the tune was “copied by the late J.M. Neale.” Neale had visited Lisbon in 1853 and 1854 as part of a commission to write a travel guide, A Handbook for Travellers in Portugal (1855). As part of these trips, he visited the Bibliotheca Publica (Nacional) at Lisbon and described the conditions there: “It is difficult to estimate the precise number of volumes, since so many duplicates, from the libraries of suppressed convents, are now in course of distribution and exchange. . . . The library is not well arranged, is very dark, and does not possess a general catalogue. Some of the most valuable books lie in heaps without any attempt at order” (p. 14). One of his companions during a May 1853 visit was Canon (later Bishop) H.L. Jenner, who assisted with Part II of the Hymnal Noted. His son later claimed that Jenner was the one who had transcribed the melody at Lisbon. Regardless of whether it was Neale or Jenner who found the tune, the original Lisbon source has never been found. Given Neale’s description of volumes “now in course of distribution and exchange,” the Missal could be anywhere, yet to be rediscovered. It wasn’t until 1966 that manuscript copies of this tune started to come to light. Once scholars were able to establish that the tune is from a processional chant, “Bone Jesu dulcis cunctis,” other sources slowly emerged. All of the known sources are listed below. Source 1. “French Missal in the National Library, Lisbon,” used for the Hymnal Noted, Part II (1856). Missing/Lost. Source 2. In an article for The Musical Times, vol. 107, no. 1483 (Sept. 1966), p. 772, Mother Thomas More (Mary Berry) described a visit to the Bibliothèque Nationale de France in Paris, in which a Mademoiselle Corbin offered her a 15th century processional that had belonged to French Franciscan nuns. One text in this volume, “Bone iesu dulcis cunctis,” bore the tune known as VENI EMMANUEL. She noted that “Bone iesu” was a trope for the funeral chant “Libera me,” and it was inscribed in such a way that the melody appears on successive left pages and a countermelody appears on the right. The official library designation is Latin 10581, dated ca. 1500, available online (here), and also shown below. Some additional bibliography is listed in the BNF catalog. This manuscript is described by another scholar as being from the Order of St. Clare in Meaux (related to the Franciscans). Source 2. Bibliothèque Nationale de France, Latin 10581, fols. 89v-101r. The chant is strophic, with the melody and countermelody repeating over the course of eight stanzas. Each stanza ends with a snippet of the related Libera me, indicating a portion of the Libera me to be inserted there. As a funeral chant, it calls on a number of heavenly figures (Jesus, Mary, angels, apostles, martyrs, and saints) for intercession on behalf of the deceased. The numerous references to names of old saints can be a challenge to interpret and identify, but a cursory analysis shows that many names can be connected to the Franciscan order, further supporting the possible Franciscan origins of the chant. For a full translation and an analysis of the text, see The Hymn, vol. 65, no. 1, pp. 21-26 (HathiTrust). Source 3. Another manuscript is held at the Honnold/Mudd Library of The Claremont Colleges in California, MS Crispin 14, described as a 16th century French processional, “probably written for a convent of Poor Clares in the diocese of Paris.” A fuller description of it can be found in Medieval and Renaissance Manuscripts in the Claremont Libraries (1986), pp. 32-33. “Bone iesu” spans folios 69v to 79v, but the pages have been bound out of order. The handwriting is very similar to Source 2. This MS, like Source 2, is a trope for Libera me. A sample is shown below from fols. 78v-79r. Source 3. Honnold/Mudd Library, The Claremont Colleges, MS Crispin 14, fols. 78v-79r. Source 4. One other similar manuscript is held by the Free Library of Phildelphia, PA, MS Lewis E 180, fols. 89v-101r, described as “made by Sister Marie Ségvier, Couvent de Cordelières, Bourg Saint-Marcel, Paris, 1603,” sold to John Frederick Lewis in 1910, donated to the library in 1936. This one, like sources 2 and 3, has connections to Paris, and the Couvent de Cordelières was part of the Franciscan order, thus the consistent Parisian-Franciscan ties between Sources 2-4. The handwriting is also very similar to Sources 2 and 3 and has the same countermelody on opposing pages. Source 4. Free Library of Phildelphia, PA, MS Lewis E 180, fols. 89v-90r. Source 5. Text only, transcribed in The Ecclesiologist, vol. 21, no. 136 (Feb. 1860), pp. 14-15. This copy is described as “a MS apparently of the date 1520, bound up with a magnificent—and much earlier—missal once belonging to the great House of Corbie, now in the Public Library at Amiens.” This one differs from Sources 1-4 in a few respects: It is prefaced by a brief introduction in Italian, it is said to be written in four parts, and it is intended for the Order of St. Barbara. The transcriptionist is probably John Mason Neale (1818–1866), and this article seems to be in keeping with a MS he mentioned in a letter to Benjamin Webb on 22 May 1859 (Letters of John Mason Neale, 1910, p. 304: Google Books). Source 6. One final manuscript is similar to—and possibly the same as—Source 5: Amiens MS 162 D, ff. 2v-10r, held at the Bibliothèque Centrale Louis-Aragon, Amiens, France. This manuscript has been studied extensively by Danish scholar Peter Woetmann Christoffersen, with his analysis given on his website. He dates the MS as 1502-1503, created in Paris, and he believes the text of “Bone Jesu dulcis cunctis” was written not earlier than 1450. Like Source 5, this one is dedicated to the Order of St. Barbara, and it is polyphonic, except it is in three parts, not four. The melody in this MS has no connection to the VENI EMMANUEL tune. In spite of the differences between Source 5 and Source 6, Christoffersen believes Source 5 is a “jumbled transcript” of Source 6. Source 6. Bibliothèque Centrale Louis-Aragon, Amiens, MS 162 D.
In summary, the melody VENI EMMANUEL is derived from a funeral procession chant, “Bone Jesu dulcis cunctis,” which was intended to be used in conjunction with another funeral chant, Libera me. The manuscripts containing this melody all relate to the Franciscan order, especially a female branch known as the Clares, and all the surviving manuscripts except Source 5 were made in or around Paris, at the dawn of the 16th century. The “Bone Jesu” text dates as early as 1450, and the VENI EMMANUEL tune dates to the late 1400s or the first decade of the 1500s. 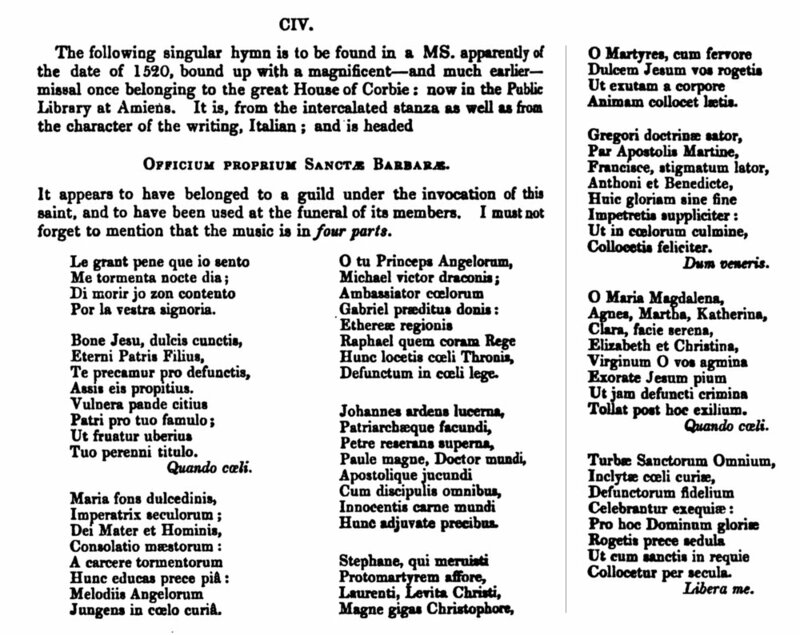 An alternate tune for the same text is connected with the order of St. Barbara, also from the same time period. C.W. Dutschke & R.H. Rouse, Medieval and Renaissance Manuscripts in the Claremont Libraries (Los Angeles: University of California, 1986), pp. 32-33.